Nature’s Sunshine VS-C® TCM Concentrate draws from traditional Chinese medicine. 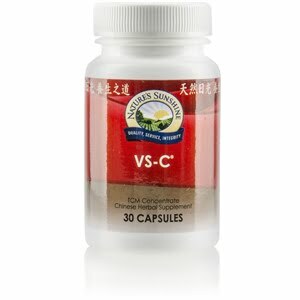 The same formula as VS-C TCM, but highly-concentrated, this blend of Chinese herbs is “metal-enhancing.” VS-C maintains an environment that promotes a healthy microbial balance, encourages natural detoxification processes, and supports the respiratory tract. Instructions: Take one or two capsules with a meal daily. Each capsule is equivalent to 5-6 capsules of regular Chinese VS-C combination. TCM denotes Traditional Chinese Medicine.